I came across an addicting website the other day while trying to remember what the name of the song where Fatboy Slim sampled Camille Yarbrough. Turns out it was of course "Praise you" and I found this neat site that puts the two youtube videos right next to each other: WhoSampled: exploring and discussing the DNA of music. 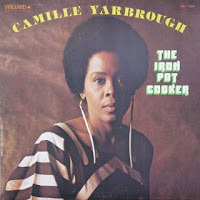 My friend Raya Yarbrough (also a vocalist) is the grand-niece of Camille Yarbrough, who is the vocalist sampled on "Praise You." I heard that Camille made so much money off this sample that she was able to buy a condo in Harlem, where she lives today. Spin Magazine called her the "fore mother of hip hop." Very cool. I think I like this tune more than most of the others because of the way Moby samples Landford: he samples the whole song. This really hardly ever happens with samples, it's usually little bits played over and over and over (oh, the joys of electronic music). Really Moby just adds an accompanying track to the vocals and I think it really adds to the tune. Check out the rest of the site, there's more good stuff there.